Wildflower Spirit Journey is a spiritual pilgrimage story, but it can also be used as a resource for personal growth and healing, especially if you are also making use of the accompanying Flower Card deck. 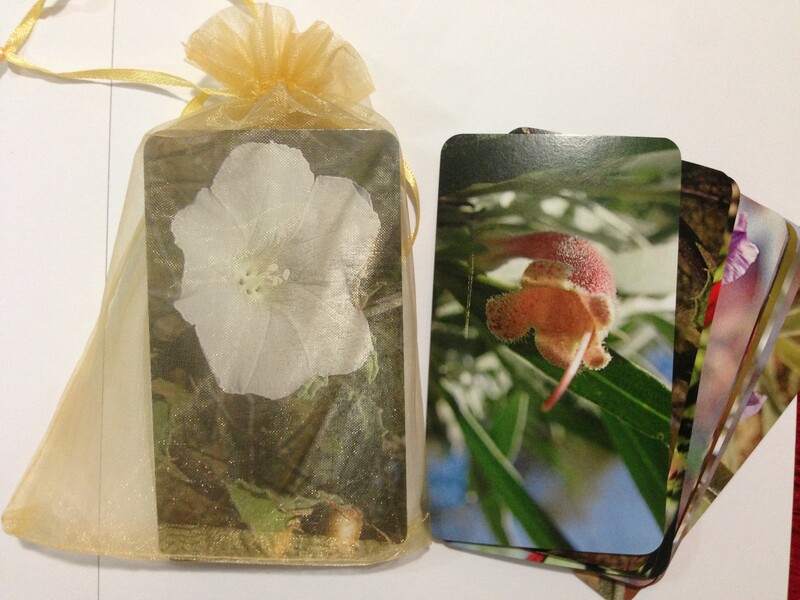 The card and book sets are very popular with Omanisa’s students and clients, who love being able to shuffle and select a card at random, while asking which flower spirit might be able to support them with healing, and then referring to the book for more information. Please contact us if you have any queries or you would like to place an order. A deck of 26 wildflower cards, featuring all of the wildflowers in the book. On the front of each card is a wildflower photograph, and on the back you’ll find the flower’s name and a list of healing mantras associated with that flower. Use the cards alone or with the book. Would you like a sneak preview? These blogs feature flowers and samples of writing from the book. Discover more flowers Central Australian wildflowers that were not featured in the book. Read about specific flowers, or come on a virtual walk through clinic and country with Om as she communes with nature and then calls these spirits in to work with her on the healing table.